In this simplified example we first generate two synthetic images as if they were taken from different view points. In the next step we find interest points in both images and find correspondences based on a weighted sum of squared differences of a small neighborhood around them. Note, that this measure is only robust towards linear radiometric and not geometric distortions and is thus only usable with slight view point changes. After finding the correspondences we end up having a set of source and destination coordinates which can be used to estimate the geometric transformation between both images. 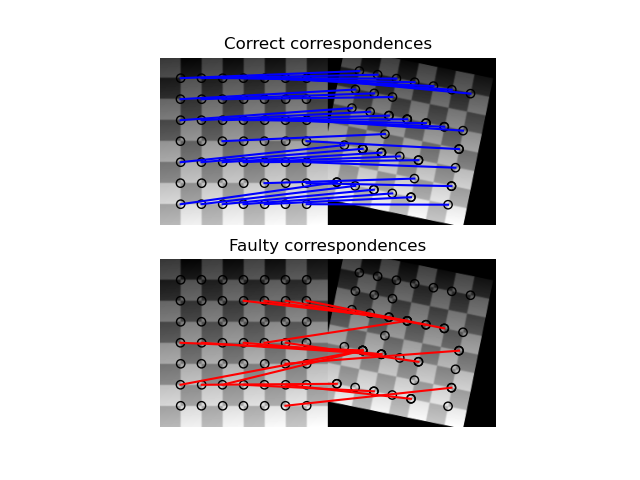 However, many of the correspondences are faulty and simply estimating the parameter set with all coordinates is not sufficient. Therefore, the RANSAC algorithm is used on top of the normal model to robustly estimate the parameter set by detecting outliers.